GAINESVILLE, Fla. — Two new species of truffles were recently discovered on the roots of pecan trees in Florida orchards. The good news is that you can eat them – the bad news is that you wouldn't want to. While Tuber brennemanii and Tuber floridanum are edible "true" truffles, in the same genus as the fragrant underground mushrooms prized by chefs, their unappealing odor and small size – about 1 inch wide – will likely discourage people from eating them, said Matthew Smith, an associate professor in the University of Florida department of plant pathology and an affiliate associate curator in the Florida Museum of Natural History Herbarium. "At least one of the species was pretty stinky and not in a good way, so you wouldn't necessarily want to eat it," Smith said. "These guys are small, and they don't have these really great odors, but the animals love them." Smith and his team were studying pecan truffles when they found the new species. "One of the things we wanted to do is identify the communities we find in these pecan orchards because those are the things that are going to be there naturally and those are the ones that are going to be in direct competition with the species we're interested in trying to grow," he said. Arthur Grupe, lead author of the study and a doctoral student in UF's department of plant pathology, said the team is researching another, more common pecan truffle, Tuber lyonii, potentially an important economic crop in Florida. Valued for their pleasant aroma and taste, pecan truffles sell for $160 to $300 per pound. Pecan orchards with a high density of pecan truffles might increase farmers' per acre profit by up to 20 percent, Grupe said. Even though the two new truffle species might lack the appetizing qualities of more commonly known truffle species, Smith said their discovery is important and points to the significance of conservation, especially in forest habitats. "Just because you don't see diversity easily doesn't mean that it's not there," Smith said. "I guess to me it speaks to the fact that there's really a lot we don't know about the natural world, and it's worth preserving so we can try to understand it." Smith said the newly described truffle species had likely gone undetected because animals – such as squirrels, wild pigs and other small mammals – were eating them or because they occur earlier in the year than pecan truffles. The researchers plan to study the new species to learn more about their relationship to pecan truffles and how they compete with other truffle species for resources. 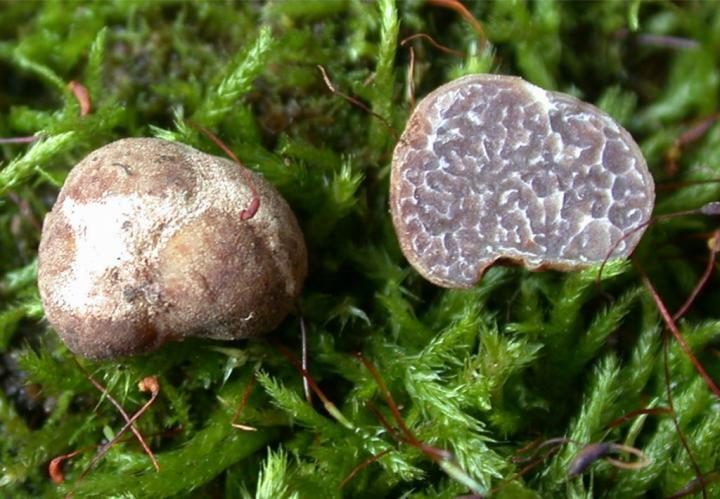 "So far, we have found these truffles mostly in Florida and Georgia," Grupe said. "Interestingly, a collaborator in Brazil found one of these species in a pecan orchard. We suspect that it hitched a ride on pecan seedlings shipped from the U.S. I think it is a great example of hidden biodiversity." Smith said people tend to be more afraid of mushrooms than curious and don't take the time to learn about them – even though new species are right under our feet. "Fungi are understudied in general, and things that fruit below ground that are hard to see are even more understudied," Smith said. "It's interesting to know these things are out there. You're walking on them all the time and they still don't have a name – no one has formally recognized them before. I think that's kind of cool." The researchers published their findings in the journal Mycologia.